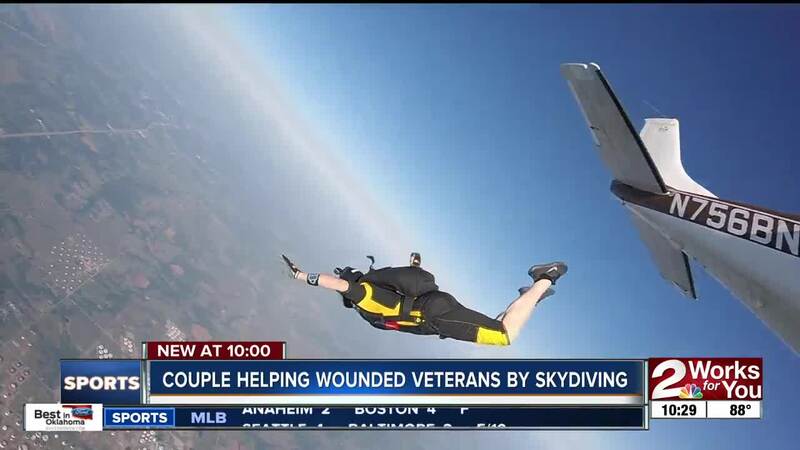 There's a couple traveling around the country taking a leap of faith for wounded veterans. 2 Works for You's Sarah Dewberry met with the couple during their skydiving stop in Cushing to talk about their mission. For these two skydiving enthusiasts - they take free-falling literally. "I got really fired up and I wanted to help," Skydiver/Co-creator of Down for 50 Annette O'Neil said. "So I enlisted Joel's support to build this incredible journey we are on. This is the first time anybody has ever skydived in all 50 states in one single trip." Stopping off at Cushing's Oklahoma Skydiving Center - O'Neil and her partner Joel Strickland - are traveling to all 50 states in a motor home to raise money for Operation Enduring Warrior, which gives wounded warriors a new perspective on life by teaching them how to skydive. "When we are skydiving nothing else exists," O'Neil said. "In free fall, under canopy, you can't keep thinking about the laundry. You can't be thinking about PTSD. You are just thinking about whats going on in your space, your body and your sky." Annette and Joel will spend the next six months traveling all over the country to help raise money and awareness for wounded warriors. "Over the course of my skydiving I find that working with military veterans - the experiences have stuck with me and are the most rewarding thing I've ever done," Strickland said. O'Neil said she got a firsthand look at the uphill battle wounded warriors faced when her father worked at a VA hospital - and wanted to do something to help. "Skydiving is massively freeing," O'Neil said. "I've talked to vets all over the country who've had the same experience of total freedom from everything that was holding them back." To keep up with their travels, check out Downfor50.org.